One of the key issues this election--unless health care manages to preempt it--is going to be the economy. Both parties are going to claim they are better at managing the economy. While economists like to look at all kinds of macroeconomic data such as GDP, for most people, the only metric they care about (assuming they care about metrics at all) is the unemployment number. So under which party does the unemployment number go up and under which does it go down? Or maybe it is random? Turns out there is a lot of data on unemployment rates at the Bureau of Labor Statistics, including monthly averages since 1948. A reader, Bob Palais, has kindly made a graph showing the data with the background indicating which party was in the White House. Here it is. Since WWII there have been 10 major peaks in unemployment. Laymen might speak of "10 recessions," but economists typically reserve the term "recession" for two consecutive quarters of negative growth in GDP. While this correlates well with unemployment, in a year where GDP grew by -3%, 0%, -5%, and 0%, there might be a lot of unemployment, but it might not formally qualify a recession, so we will stick with "peaks in unemployment." 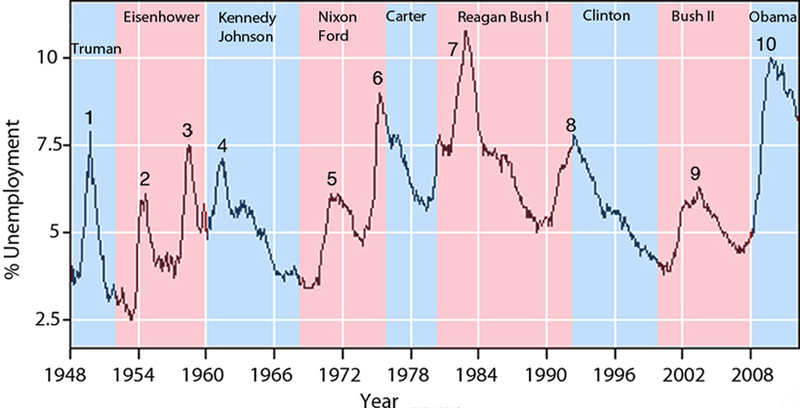 From the graph above, all but two or three peaks (#1, #4, and maybe #7) started during Republican administrations. Peak #7 is a bit ambiguous. The rise certainly started during Carter's administration, but then it began to fall during the early days of the Reagan administartion. After that it rose sharply. So one could arguably allocate peak #7 to either Carter or Reagan. In most cases it continued for a while during the administration where it started, one exception being the Bush II administration, which ended before the damage due to the bubble bursting was fully visible. The fact that unemployment tends to spike during Republican administrations is not an accident. It has to do with fundamental differences between the parties. Republicans prefer to let the market run its course, and if that means high unemployment, so be it. To some extent, businesses like high unemployment because it keeps wages down (although it also reduces the collective buying power, which they don't like). Democrats generally are interventionists and believe the government should take action to reduce unemployment when it threatens, so they can often hold it at bay. In other words, Democrats tend to be Keynesians while Republicans are more laissez faire when it comes to the economy. Another difference between the parties is that Democrats often propose and execute large government programs (although Eisenhower built the interstate highway system). Large government programs create jobs, mostly in the private sector since the government contracts out much of it.